Martin Luther King Day made me think about how we teach civil rights. The ERIC database has some resources for teaching Dr. King’s dream. First of all the ERIC thesaurus lists “civil rights” as an official subject term. It also lists narrower terms (for ex., “equal education”) and related terms (for ex., “freedom of speech”). Since many schools now have civil rights teams, I tried the term as a simple keyword search. My very rough search yielded, among other documents, a lesson plan from 1964 (Byrd et al, 1964). With a background in adult education I also remembered the Highlander School, now the Highlander Research and Education Center, which played an important role in the Civil Rights movement (Highlander Research and Education Center, 2012). Indeed ERIC contains material on the school and its approach. I’ll close with three other relevant links. 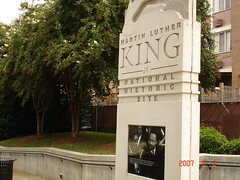 The first is for The King Center in Atlanta. The second is USM Libraries’ guide on the Civil Rights Act of 1964. Thirdly, let’s not forget the Jean Byers Sampson Center for Diversity in Maine. Let’s keep working toward the dream!